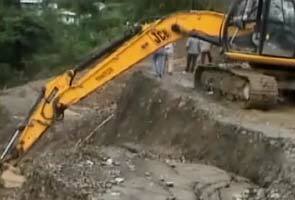 Imphal, Jul 24 : Manipur has once again been cut off from the rest of the country by road for the past one week. This time, it's a crippling landslide that has shut the only motorable highway into the state. Authorities say repairs will be extensive and time-consuming. Heavy vehicles like trucks that carry essential supplies into the state are stranded in neighbouring Nagaland. This has led to crippling shortages, both in the state capital Imphal and other districts of the state. This is a yearly routine in Manipur. In the past years, economic blockades on the state's only highway that connects the state to the rest of India led to massive shortage of essential supplies, including fuel and LPG cylinders, and even groceries. This year the culprit is the massive landslide on the National Highway that connects Dimapur in Nagaland to Manipur's capital Imphal. Not a single truck has managed to pass through the highway since July 16. A way has been cleared though, for smaller vehicles. Pramod Kumar Singh, an engineer at Border Roads Task Force, in-charge of the highway, says that the cut in the road is so deep that some land will have to be acquired for repair work and it will take time. There is another road to Manipur via Assam. But most of it is broken down and hardly fit for even smaller vehicles to pass. The Imphal valley is feeling the pinch the most. Be it petrol, LPG, rations, everything is in short supply in Imphal. The government says they are doing their best to resolve the crisis through urgent repairs, but on the ground people are already impatient.